The temptations with which the Bodhisattva grappled are personified as the daughters of Mara, the evil one. In common with practically all the Kandyan temple paintings, the female as temptress, at the Dambulla Rock Temple, Sri Lanka, as shown here, is in dance pose. 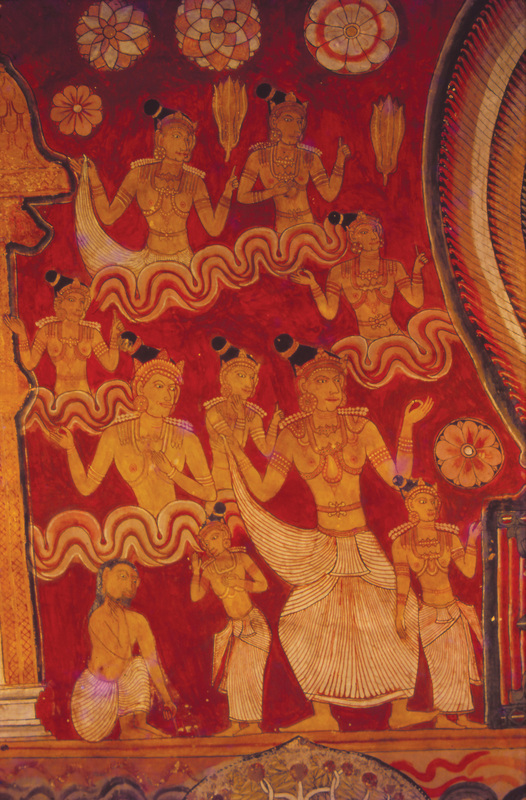 However, none of the daughters of Mara shown in the paintings of the Kandyan period can be described as sensuous creatures. For the 18th century Kandyan painter, the female as seductress perhaps lacked conviction. Sirima Kiribamune, "Women dancers as temptresses," online in Digital Library for International Research Archive, Item #12653, http://www.dlir.org/archive/items/show/12653 (accessed April 18, 2019).